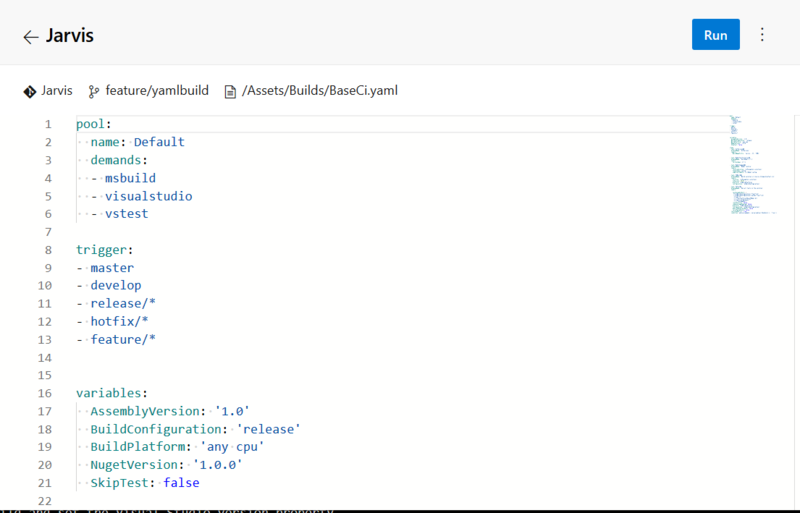 I cannot stress you enough on how better is the experience of having builds defined in code than having build definition on the server, so I’m here to convince you to move to the new YAML build system in Azure DevOps :). Having build definition in Code gives you many benefits, the first is that builds evolve with code branches. 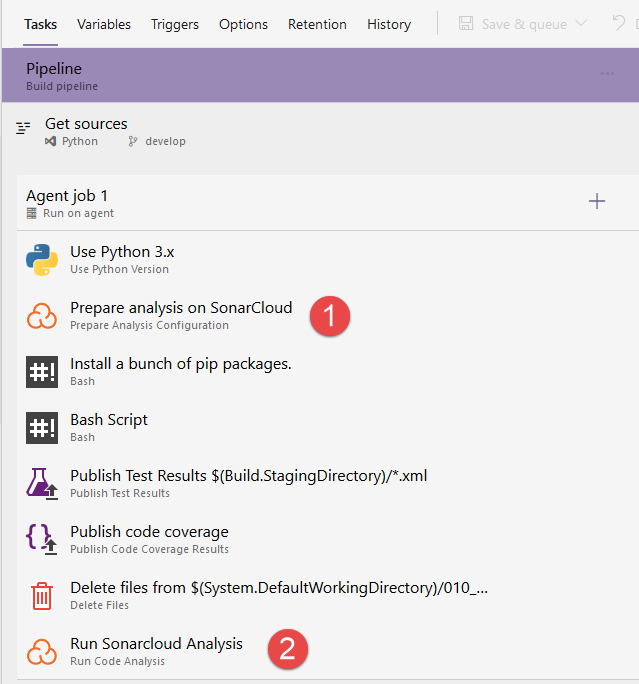 If you still think that editing a YAML file is a daunting experience because you have tons of possible tasks and configuration to use, take a peek to the Azure Pipeline extension Visual Studio Code Addin, that brings intellisense for your pipeline editing in Visual Studio Code. I strongly encourage you to have a look at the YAML schema reference to have a complete knowledge of the syntax, but for most people a quick approach to the tool is enough, leaving the deep dive for when they need to do complex stuff. 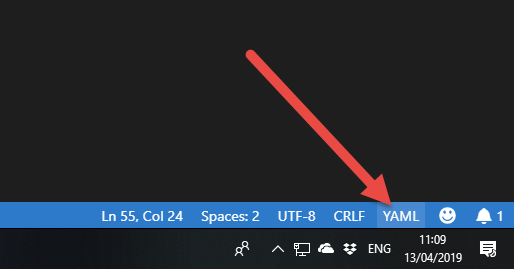 That area is the Language Mode Selection, and it is where you specify to Visual Studio Code what is the language of the file you are editing. 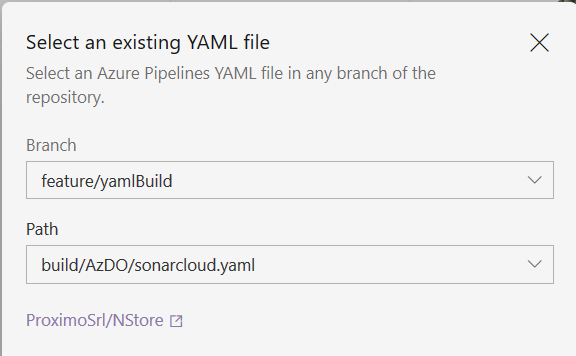 If you simply open a YAML file, VS Code recognize the yaml extension and helps using standard YAML syntax, but it does not know anything about Azure DevOps Pipeline. Thanks to the Language Mode Selector, we can now specify that the file is a Azure Pipeline file and not a standard YAML file. Figure 2: Selecting the right language type allows VS Code to give you tremendous help in editing the file. In real scenario you usually starts from some template file (another advantage of having build in code), you already prepared with standard build for you project, but even in that scenario having intellisense to refine the build will help you in choosing tasks. 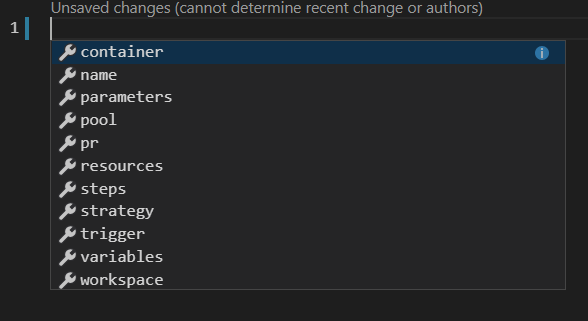 I can assure that, after some usage, it is far more powerful and quick to edit a build with VS Code than to edit a standard build made with tasks in the Web based editor. Graphical editor are powerful and are a good entry point for those who does not know the instrument, but intellisense powered editors are more productive and powerful. The only drawback I found is using custom tasks that were not recognized by the intellisense, as my GitVersion Task, that was marked as wrong because VS Code does not know it. Intellisense will completely remove the need of the old trick of creating a build with the old editor, place tasks in the pipeline and then letting the tool generates YAML definition based on how you configured the task in graphical editor. I assure you that it is faster to directly copy a reference build and then add needed tasks with intellisense in VS Code than using UI editor. The assistant allows you to configure the Task with the very same UI experience you have in UI Based pipeline, once the task is configured you can simply add corresponding YAML to the definition. Task assistant gives you the same add experience for tasks of the old UI editor, so you can configure the task with graphic editor, then add corresponding YAML syntax to the definition. I think that with Task Assistant there are no more excuses not to move to YAML based definition. Could not find a pool with name Default. The pool does not exist or has not been authorized for use. For authorization details, refer to https://aka.ms/yamlauthz. Ok this is frustrating and following the link gives you little clue on what really happened. The problem is that, with the new editor experience, when you navigate to the pipeline page, all you see is the editor of YAML build and nothing more. Figure 2: New Editor page of YAML pipeline, advanced editor and nothing more. The new editor is fantastic, but it somewhat hides standard configuration parameters page, where the default branch can be set. As you can see from Figure 2 you can specify pool name (default) and triggers directly in YAML build so you think that this is everything you need, but there is more. Clicking on the three buttons in the right upper corner you can click on the trigger menu to open the old editor. 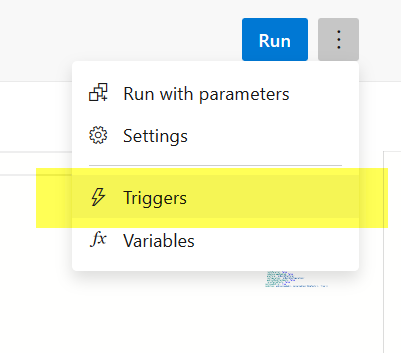 This is where the YAML pipeline experience still needs some love, you are surely puzzled why you need to click triggers menu item if you already specified triggers directly in the YAML definition, but the reason is simple, it will open the old pipeline editor page. Trigger page is not really useful, it only gives you the ability to override the YAML configuration, but the important aspect is that we can now access the first tab of the YAML configuration to change default branch. Figure 4: Trigger page is not useful, but now we can access default configuration for the pipeline. In Figure 5 you can now understand what went wrong, the wizard created my pipeline using master as default branch, but clearly my buid YAML file does not exists in master, but exists only in my feature branch. Yust change the default build to the branch that contains your build definition file, save and queue again; now everything should word again. This trick works also when you got errors not being authorized to use endpoints, like sonar endpoint, nuget endpoint etc. 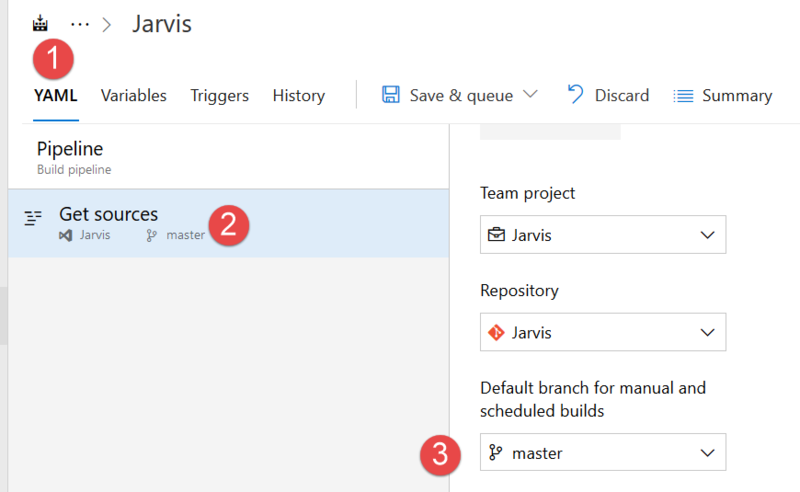 I’ve blogged in the past about deploying ASP.NET application, but lots of new feature changed in Azure DevOps and it is time to do some refresh of basic concepts. Especially in the field of web.config transform there is always lots of confusion and even if I’m an advocate of removing every configuration from files and source, it is indeed something that worth to be examined. The best approach for configuration is removing then from source control, use configuration services, etc and move away from web.config. 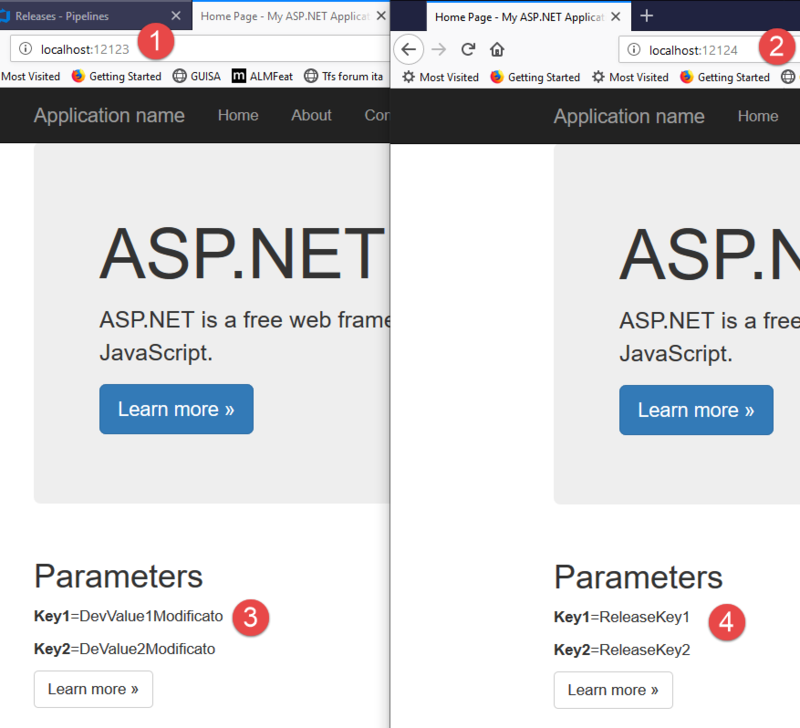 But since most people still use web.config, lets start with a standard ASP.NET application with a Web.Config and a couple of application settings that should be changed during deploy. When it is time to configure your release pipeline, you MUST adhere to the mantra: Build once, deploy many. This means that you should have one build that prepares the binaries to be installed, and the very same binaries will be deployed in several environment. 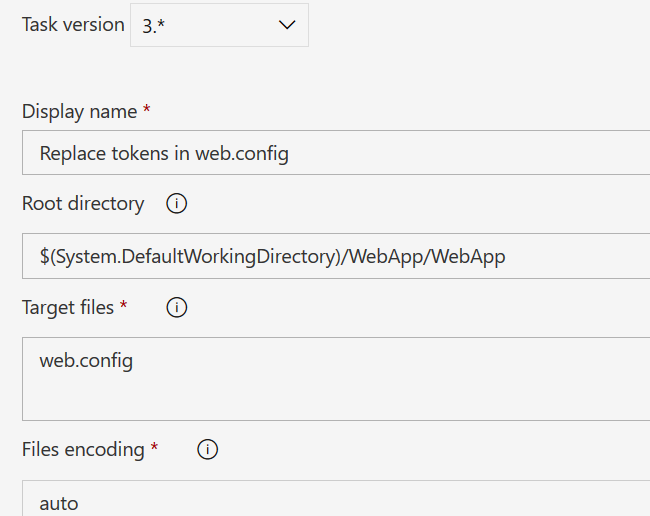 Since each environment will have a different value for app settings stored in web.config, I’ll start creating a web config transform for the Release configuration (then one that will be released), changing each configuration with a specific token. In Figure 2 I show how I change the value of Key1 setting to __Key1__ and Key2 to __Key2__. This is necessary because I’ll replace these value with the real value during release. The basic trick is changing configuration values in files during the build, setting some tokenized value that will be replaced during release. Using double underscore as prefix and suffix is enough for most situations. Now it is time to create a build that generates the package to install. The pipeline is really simple, the solution is build with MsBuild with standard configuration for publishing web site. I’ve used MsBuid and not Visual Studio Task, because I do not want to have Visual Studio on my build agent to build, MsBuild is enough. Figure 3: Build and publish web site with a standard MsBuild task. If you run the build you will be disappointed because resulting web.config is not transformed, but it remains with the very content of the one in source control. This happens because transformation is an operation that is not done during standard web site publishing, but from Visual Studio when you use publish wizard. Luckly enough there is a task in preview that performs web.config transformation, you can simply place this task before MsBuild task and the game is done. As you can see in Figure 4, you should simply specify the directory of the application, then choose XML transformation and finally the option to use web.$(BuildConfiguration).config transformation file to transform web.config. Now you only need to copy the result of the publish into the artifact staging directory, then upload with standard upload artifact task. Figure 5: Copy result of the publish task into staging directory and finally publish the artifact. If you read other post of my blob you know that I usually place a PowerShell script that reorganize files, compress etc, but for this simple application it is perfectly fine to copy the _PublishedWebsites/ directory as build artifact. Figure 6: Published artifacts after the build completes. Take time to verify that the output of the build (Artifacts) is exactly what you expected before moving to configure the release. Before going to build the release phase, please download the web.config file and verify that the substitution were performed and web.config contains what you expected. Fiure 7: Both of my settings were substituted correctly. Now it is time to create the release, but first of all I suggest you to install this extension that contains a nice task to perform substitution during a release in an easy and intuitive way. One of the great power of Azure DevOps is extensibility, there are tons of custom task to perform lots of different task, so take time and look in the marketplace if you are not able to find the Task you need from basic ones. Lets start creating a simple release that uses the previous build as artifact, and contains two simple stages, dev and production. Figure 8: Simple release with two stages to deploy the web application. Each of the two stages have a simple two task job to deploy the application and they are based on the assumption that each environment was already configured (IIS installed, site configure etc), so, to deploy our asp.net app, we can simply overwrite the old installation folder and replace with the new binaries. Figure 9: Configure replace token suffix and prefix to perform substitution. 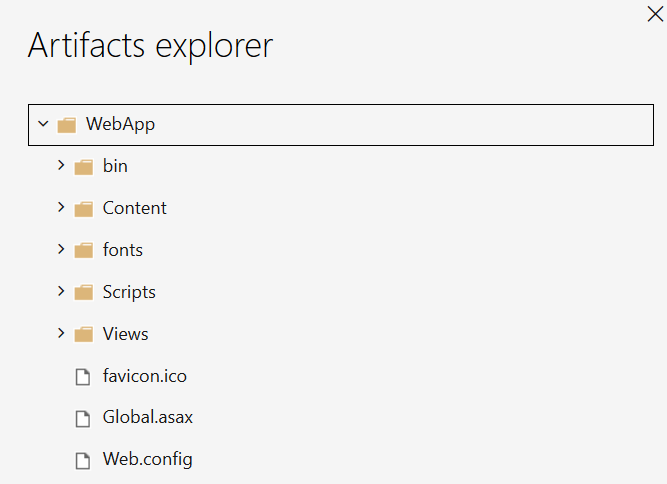 In this example only web.config should be changed, but the task can perform substitution on multiple files. Figure 10: Substition configuration points to web.config file. The beautiful aspect of transform task is that it uses all the variables of the release to perform substitution. For each variable it replace token using prefix and suffix, this is the reason of my transformation release file in the build; my web.config file has __Key1__ and __Key2__ token inside configuration, so I can simply configure those two variables differently for the two environment and my release is finished. If you use Grid visualization it is immediate to understand how each stage is configured. Figure 11: Configure variables for each stage, the replace task will do the rest. Everything is done, just trigger a release and verify that the web config of the two stages is changed accordingly. Figure 12: Sites deployed in two stages with different settings, everything worked as expected. Everything worked good, I was able to build once with web.config tokenization, then release the same artifacts in different stages with different configurations managed by release definition. I’ve blogged in the past about YAML build in azure DevOps, but in that early days, that kind of build was a little bit rough and many people still preferred the old build based on visual editing in a browser. One of the main complaint was that the build was not easy to edit and there were some glitch, especially when it is time to access external services. After months from the first version, the experience is really improved and I strongly suggest you to start trying to migrate existing build to this new system, to take advantage of having definition of build directly in the code, a practice that is more DevOps oriented and that allows you to have different build tasks for different branches. YAML Build is now a first class citized in Azure DevOps and it is time to plan switching old build to the new engine. You can simply start with an existing build, just edit it, select one of the phases (or the entire process) then press View YAML button to grab generated YAML build. 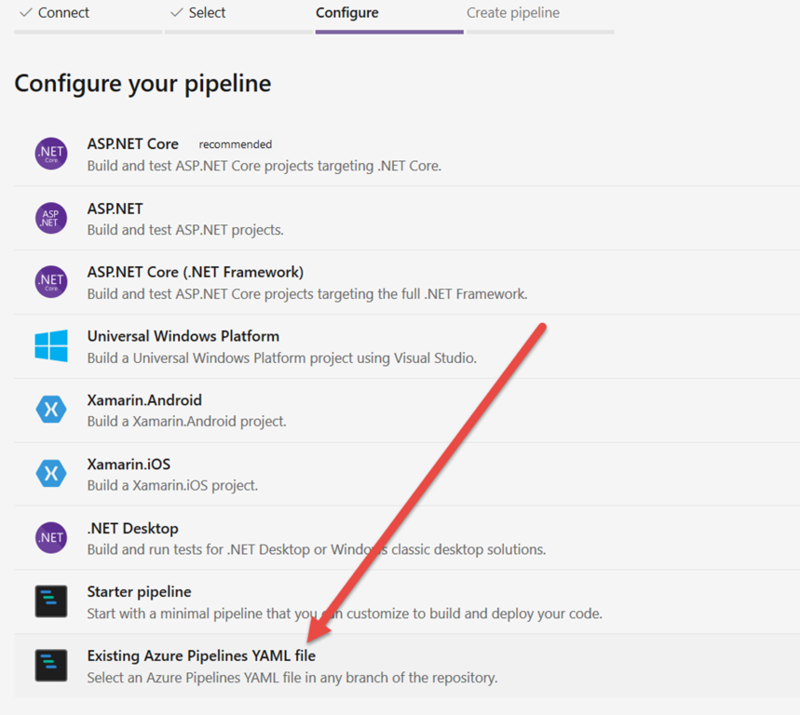 Just select a repository and select the option Existing Azure Pipelines, if you are starting from scratch you can create a starter pipeline. Figure 4: Choose the option to use an existing pipeline. You are ready to go, just choose branch and yaml file and the game is done. 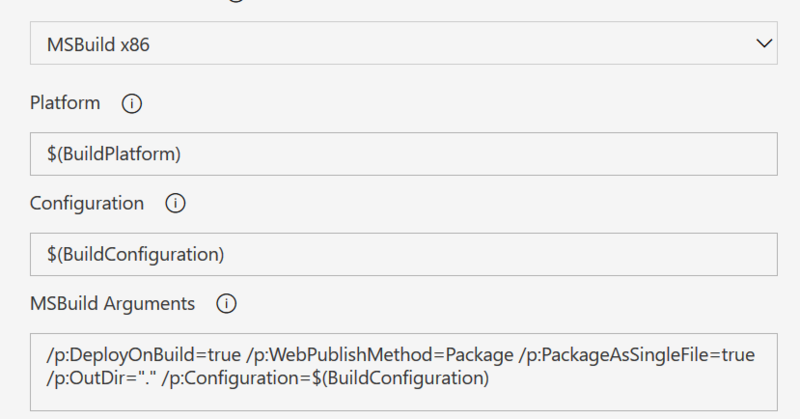 Figure 5: You can directly specify the build file in the pipeline creation wizard. Converting an existing build pipeline to YAML it is matter of no more than 10 minutes of your time. Figure 6: Your build is ready to run inside Azure DevOPS. Your build is now ready to run without any problem. 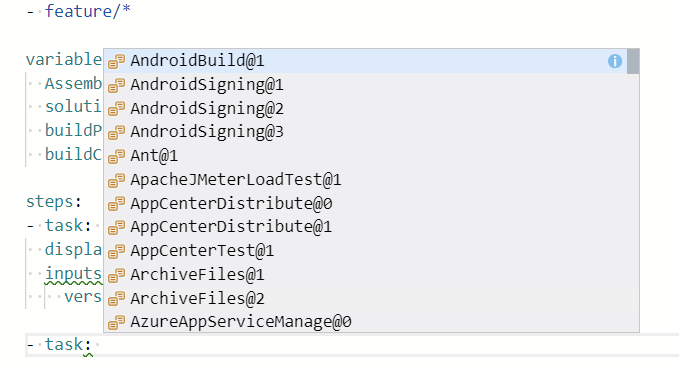 If you specified triggers as in Figure 6 you can just push to the repository to have the build automatically kicks in and being executed. You can also directly edit the build in the browser, and pressing the Run button (Figure 6) you can trigger a run of the build without the need to push anything. But the coolness of actual YAML build editor starts to shine when you start editing your build in the web editor, because you have intellisense, as you can see in Figure 7. Figure 7: YAML build web editor has now intellisense. Figure 9: Helps gives you helps for the deprecation of old task that should not be used. With the new web editor with intellisense, maintaining a YAML build is now easy and not more difficult than the standard graphical editor. 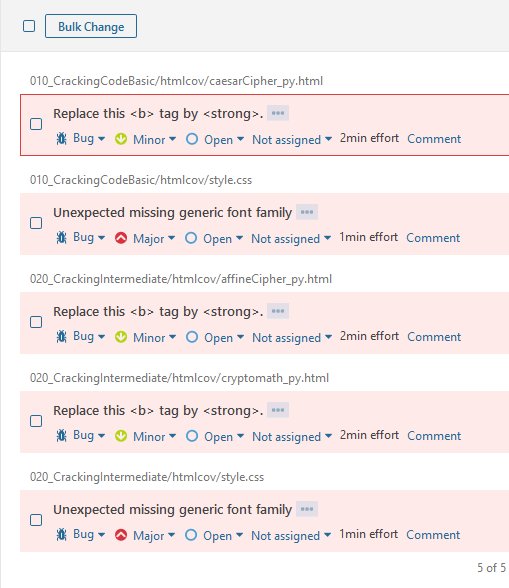 Outdated tasks are underlined in green, so you can immediately spot where the build definition is not optimal, as an example if I have a task that have a new version, the old version is underlined in green, and the intellisense suggests me that the value is not anymore supported. This area still need some more love, but it works quite well. Once you have test and Code Coverage for your build of Python code, last step for a good build is adding support for Code Analysis with Sonar/SonarCloud. 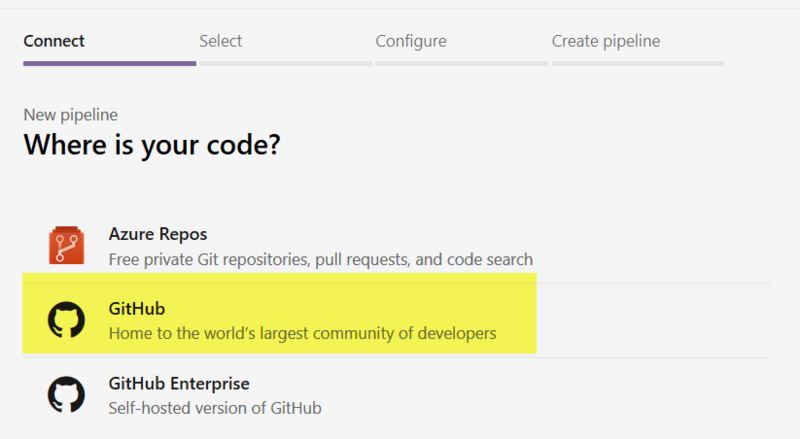 SonarCloud is the best option if your code is open source, because it is free and you should not install anything except the free addin in Azure Devops Marketplace. 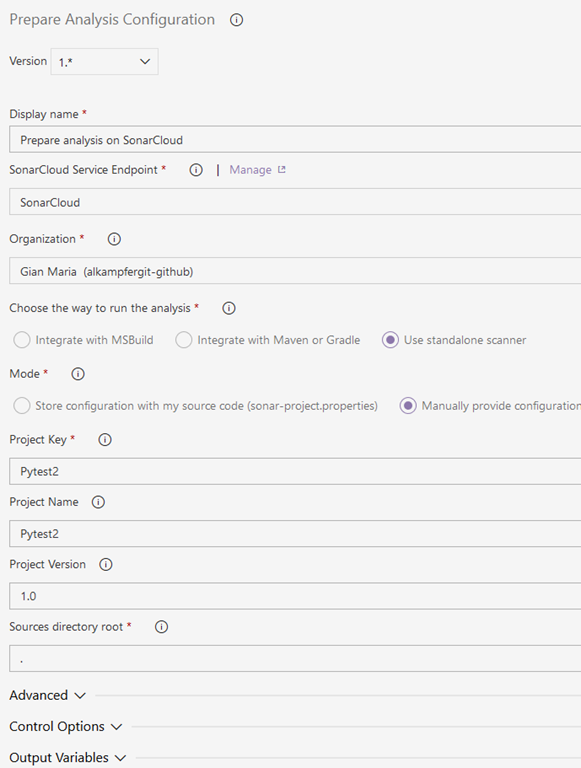 From original build you need only to add two steps: PrepareAnalysis onSonarCloud and Run SonarCloud analysis, in the same way you do analysis for a .NET project. Figure 3: Failed Sonar Cloud analysis caused by output of code coverage. You can clearly do a better job simply configuring Sonar Cloud Analysis to skip those folder, but in this situation a simple Delete folder task does the job. To avoid cluttering SonarCloud analysis with unneeded files, you need to delete any files that were generated in the directory and that you do not want to analyze, like code coverage reports. Another important settings is the Advances section, because you should specify the file containing code coverage result as extended sonar property. Figure 4: Extra property to specify location of coverage file in the build. 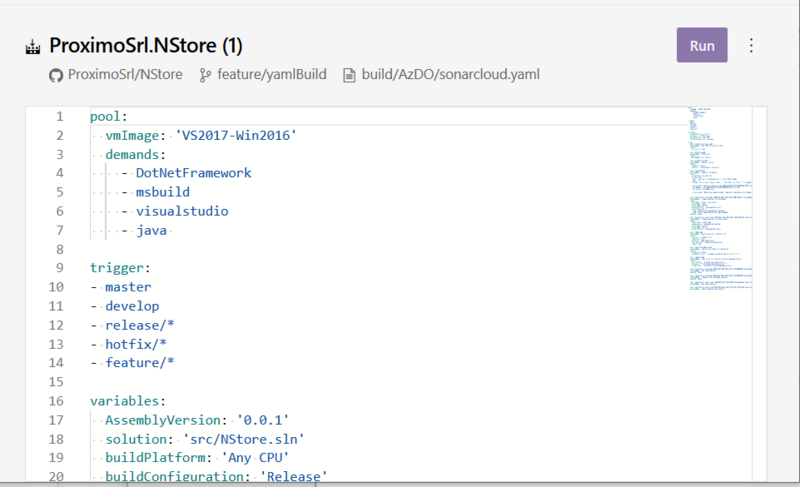 Now you can run the build and verify that the analysis was indeed sent to SonarCloud. Figure 5: After the build I can analyze code smells directly in sonar cloud. If you prefer, like me, YAML builds, here is the complete YAML build definition that you can adapt to your repository. 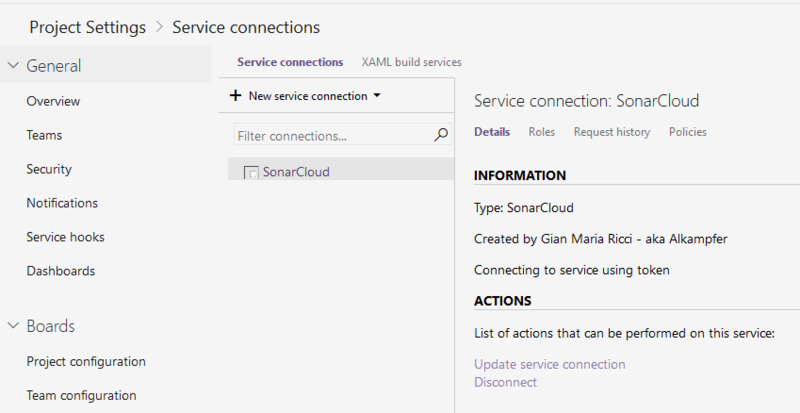 The only settings you need to adapt is the name of the SonarCloud connection (in this example is called SonarCloud) you can add/change in Project Settings > Service Connections. Figure 6: Service connection settings where you can add/change connection with Sonar Cloud Servers. 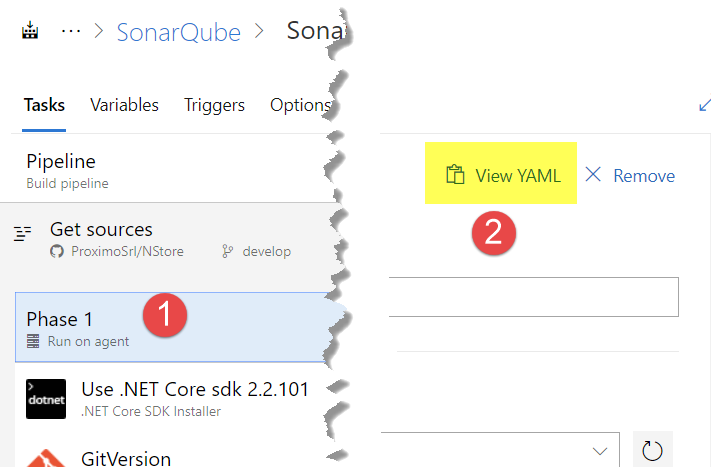 A possible final step is adding the Build Breaker extension to your account that allows you to made your build fails whenever the Quality Gate of SonarCloud is failed. Thanks to Azure DevOps build system, creating a build that perform tests and analyze your Python code is extremely simple.